As a very young child I was taught not to play with snakes. "Kill all of them and bring each one to a grown up afterward to find out if it was poison or not." That is what my directions were. That is the rule I grew up with and still have the same mindset now as a grown up. The big difference is I don't have to take the dead snake to anyone for identification. It is still clear in my mind from that Spring day 65 years ago when I was with several grownups in a group Morel mushroom hunting on my step grandpa's farm. Grandpa walked upon two long brownish snakes that had their heads stuck in a single hole. He grabbed one by the tail with his hand, and lashed it rapidly over the top of his shoulder, and popped the snake like it was a leather bull whip. The snake's head seemed to explode. He picked up the other snake by the end of its tail and popped its head the same way. It was a powerful demonstration to everyone in the group of how tough Grandpa was and how easy it was to dispatch a snake quickly. That method looked like fun to me but I continued to carry my 5 foot long, one inch thick, Hickory snake stick. Grandpa had been bitten in the leg by a Rattlesnake many years before and he was lucky to have survived in those days of no antivenin (venom) supplies. One of his cows was hit in the lower jaw by a poisonous snake and her head swelled up to double normal size. The cow survived. We guessed that the cow got its head too close to the snake when grazing. A year or so later, in middle April, two other boys and I were hunting mushrooms adjacent to the railroad tracks. We came upon a small tree without leaves and noticed a huge snake sun bathing, stretched out across several limbs. My handy snake stick killed the snake which was over 5 feet long and as big around as my forearm. We carried it to town and asked the spit and whittle men outside the hardware store what kind of snake it was. They said it was a Cottonmouth water moccasin. One of the men took his pocket knife and pried open the snake's mouth. The inside of the snake's mouth was pure white. I was glad that the bull whip method had not been attempted by me with that dangerous snake. A neighbor across the street at Milton, Florida in 1961 had seen me bring in several large Bass and inquired if he and his wife could go fishing at my favorite fishing hole on Rte 191 west of Milton. We went to the spot where a creek ran under a concrete bridge a couple of miles from town. I led them on a narrow path through willows toward the deep hole where the Lunkers were. Suddenly we were confronted by a huge Cottonmouth directly on the path. We stopped. The snake typified the recalcitrant breed and seemed determined to block the path. It was then that I drew the .38 Special bullet launcher from under my left armpit, aimed for the snake's head and fired. The projectile struck the snake a half inch behind the head, flipping the snake backward about five feet. The snake whirled around, sped to the water and disappeared about eight feet down where the water became black. My companions were constantly looking around nervously but we still caught several nice sized Bass. They never mentioned returning to my favorite fishing hole. Many snakes were encountered and killed by me throughout my life which included almost 24 years in the Marine Corps traveling to distant parts of the world. I became acquainted with Sea Snakes, deadly Vietnam two-steppers and other poisonous snakes like the Okinawa Habu and the Southeast Asian Kraits and Cobras. 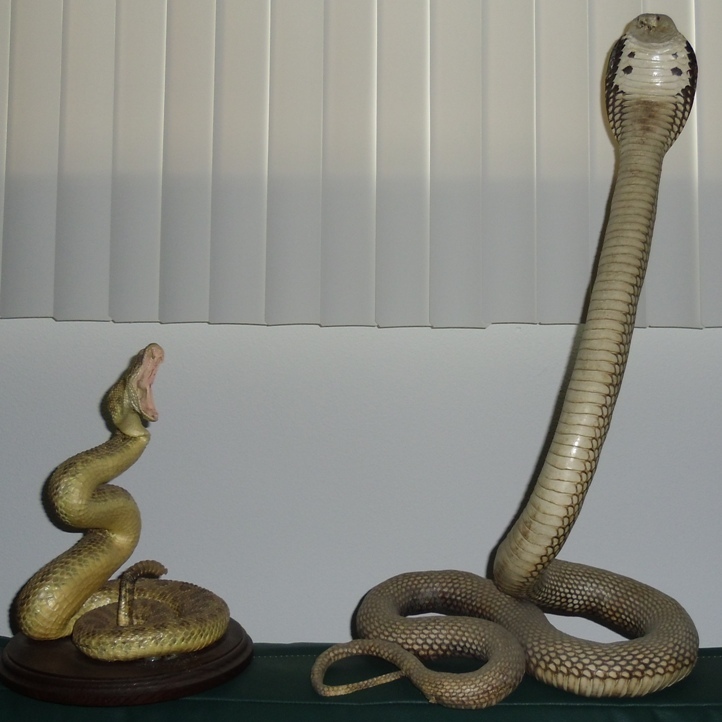 On the desk in my Marine Room are two stuffed snakes. One is a Cobra that is raised high with the hood in a menacing spread. The other is a Rattlesnake that is in a striking pose. My grandchildren are cautiously interested in the snakes but they do not sleep on the day bed in that room. My saintly wife is frightened of all snakes. She can spot a snake one hundred yards away and demand that I go kill it. I attempt to kill all snakes she sees on our lot. After 16 years of killing snakes on the property I believe the total is at 27 and one half. I say one half of a kill because the forward two thirds of the snake was not found. They were all non poisonous varieties. There were so many snakes around the yard that even the eagles would capture them for us. I heard the loud flapping of powerful wings and came outside to the pool where my wife pointed to where an Osprey had dropped a snake on the tiled surface adjacent to the pool. The snake left a trail of blood across the tiles, over the wall of the flower bed and out of the yard. The snake must have put up a terrible fight with the Sea Eagle to have escaped. I have seen big eagles carrying huge snakes that dangled 4-5 feet below their talons. The snakes were so heavy that the heads hit the tops of trees and barely cleared our roof. I have watched Grand White Egrets swallow water moccasins and Blue Herons down snakes too big and too long to keep down. I grew tired of watching a Blue Heron swallow a Cottonmouth at least a dozen times and regurgitate the snake back up because it was about 5 inches too long. The snake would go down head first easily, hit the bottom of the throat, start piling up switch-back fashion just under the bird's chest only to be brought back up. I never got to see how the long neck birds subdued the snakes. I suppose by a fast strike on the snake's head. I was 60 years old before I had the chance to try Grandpa's bull whip action on a snake. My wife and I parked our car in the parking lot in front of a brick building which housed a clinic we were visiting. As we approached the building, I saw what looked like a serious crack in the bricks at the left corner of the building. We entered and after finishing our errand there, we came back out the entrance. I turned right to see what was happening to the bricks at the right front corner. Within 6 feet of the corner I could distinguish a long brown snake lying diagonally in the brick grooves with its head beyond the corner. Stepping to my left to see what was around the corner, I could see the head of the snake stretched out beyond the bricks to the edge of an emergency exit door. The snake's head was about 5 feet above the ground and its head a scant 4 inches from the door. The door was slightly ajar and the indoor air conditioning was being forced out the crack of the unclosed door which caused an audible "Hisssss.." The snake must have been mesmerized. It bothered me that someone might walk out the door and be struck by the snake. It was time for the Grandpa maneuver. I reached over and grabbed the snake by the tail, pulled it from the brick wall and turned to my left swinging the snake out in front of me towards the parking lot. My wife looked over to see where I was going in time to see the snake stretching toward the parking area with me holding onto its tail. She screamed and ran into the parking lot. She screamed over and over as she darted from car to car to escape the snake. A nurse we knew named Betty Jones had just gotten out of her car for the mid shift when she heard screaming and saw me lashing the air with this long snake that got longer each time I tried to pop its head. Nurse Betty ran deeper into the parking lot screaming like a police car. The first trip back on the snap phase of my endeavor caused the angry snake to withstand the pop and its head seemed to reach for me and pass within inches of my face as I launched him again like a bull whip. The snake continued to withstand the attempts to pop his head. Finally it must have seemed like a roller coaster ride and the snake relaxed. It was then that I felt his head reach the end of the snap and I knew the snake had lost the battle. My wife and Nurse Betty were still running among cars and screaming. I popped his head a couple of more times and then flung the snake onto the lawn about 50 feet in front of the clinic entrance. Nurse Betty was shaking as she hurriedly entered the front door of the building. And, my pale faced, saintly wife demanded I take her home. Two of the clinic women came out with a shovel and pounded the wiggling snake to insure it would stop squirming before sundown. Since my wife was not impressed with my new snake killing technique and neither was I, it was mutually agreed that I would go find a stick next time.